After adding a new achievement type a new menu will appear in your admin area named Achievements. Inside the achievements menu will appear new sub menus with each achievement type registered to let you manage the achievements similar to WordPress default posts or pages. Are you looking for a step-by-step tutorial to setup achievements of an achievement type? On the achievement edit screen you have the Achievement Data box that includes some useful options to configure the way an achievement will work. 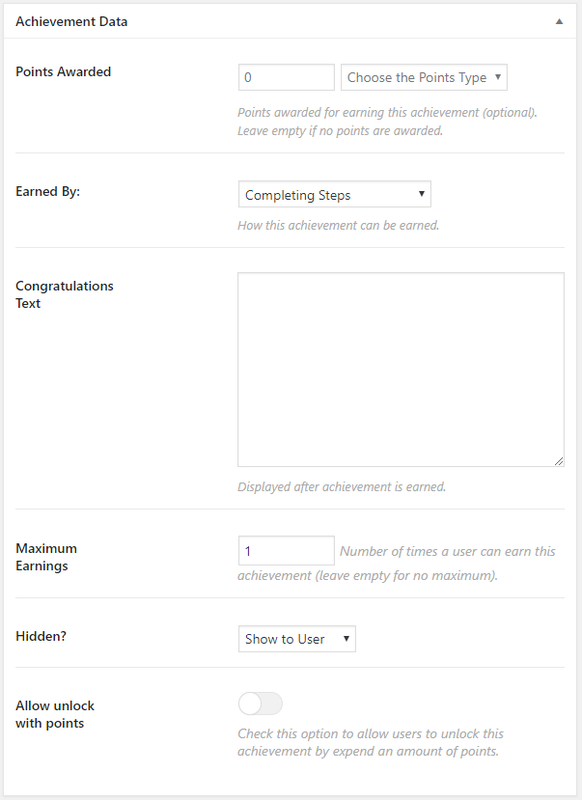 The amount of points to award to the user for earn the achievement (Optional). The points type of the amount of points to award (Optional). To define how this achievement can be earned. Choosing “Completing steps” will add a new box to configure the steps required. To find more information about how this steps work visit this page. The fewest amount of points required to earn the achievement. The points type of the amount of points required to earn the achievement (Optional). The rank type of the rank required to earn the achievement (Used to quickly filter the options showed at rank required field). The rank required to earn the achievement. The text displayed after achievement is earned. Maximum number of times a user can earn the achievement. You can leave it empty for no maximum. Checking this option will hide the achievement on frontend. Checking this option will allow users to unlock this achievement by expend an amount of points. Amount of points needed to optionally unlock this achievement by expending them. Points type of points required to unlock this achievement by expending them (optional). For each achievement you create you can configure an unlimited number of required steps to be considered complete. For more information about how this steps work visit this page. On the achievement edit screen you have the Achievement Template box that will let you to configure options on the achievement single view. Checking this option will add a list of users who have earned this achievement on the achievement single view. 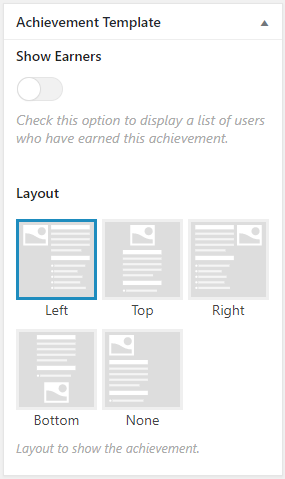 Layout to use on the achievement single view.